Intimate, cosy, and deliciously rustic, the Black Bear Tahoe boasts luxurious accommodation in a relaxed mountain setting. Perched right on the lake with magnificent views of the Big Blue, and the Sierra Mountains as a back drop, Black Bear is the place to unwind and enjoy all that fresh mountain air and alpine loveliness. With only five main guestrooms and 3 separate cabins, it’s the ultimate woodland hideaway. Set on the southern most point of Lake Tahoe, the hotel is located in a secluded setting surrounded by ancient Sequoia tree’s and of course only steps away from the crystal clear waters of the lake. At night you can enjoy perfect silence only broken by the sounds of nature. Close to the hotel are quaint shops and restaurants as well as the wealth of activities to be enjoyed around the lake. The whole lodge is designed with warmth and comfort in mind. With sturdy oak panelling and large leather sofas, you’ll want to spend the afternoon curled up with a good book. Each of the five rooms boasts different styles and colours but all display a certain authentic Californian element, with stone fire places and Native American influences. All rooms have large sunken baths, where you can lie back and relax after a long day on the slopes. For the ultimate private escape, hole up in a cabin which comes with large living spaces and a private outdoor patio, the perfect setting to indulge in one of the lodge’s famous hearty breakfasts. The positioning of the hotel is the ideal spot to get out on the lake and explore the beautiful wildlife and majestic scenery. 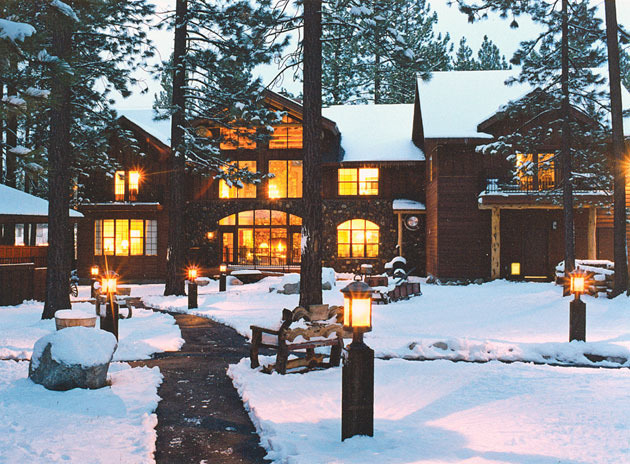 During the winter months the hotel is right at the base of Tahoe’s epic ski runs, so you can roll out of bed and be right in the heart of all the action. With a newly acquired chef on-board, the hotel’s restaurant is a divine foodie experience, with the scent of freshly baked breads and pastries wafting through the corridors, you’ll find it hard to resist an afternoon snack by the fire place.